Over the years, I’ve been fortunate to collaborate on public art projects with artists such as Janet Zweig. We’ve partnered on her art projects in Seattle, New York, Orlando and St. Louis. Most recently, she was commissioned as the creative force behind a project called the “Redmond Moving Art Center” in Redmond, Oregon. The project vision called for a mobile trailer like you’ve never seen before! My first impression of the concept drawing was that it looked like a futuristic horse trailer. 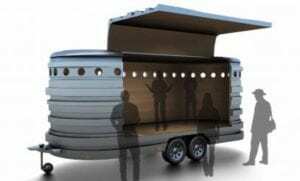 The trailer has two components…a mobile stage and a recording studio. 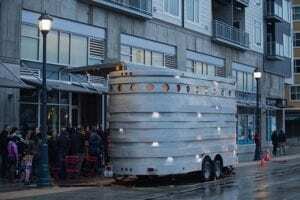 The vision of the folks behind the project is to bring out the trailer at Redmond’s festivals, parks and neighborhoods and, with the help of a producer, record local content. Our job is to collaborate with the artist on figuring out how to bring their concept to life. And the first step was taking a close look at how project vision meshes with financial considerations. Can it be done or what changes need to be made is the key question. We call it value engineering. It’s what gets us to the “landing budget”. From the get go it was clear that our approach would be to purchase and trick out a brand new trailer rather than build a trailer from the ground up. The purchased trailer came with all the pre-made structural engineering done. 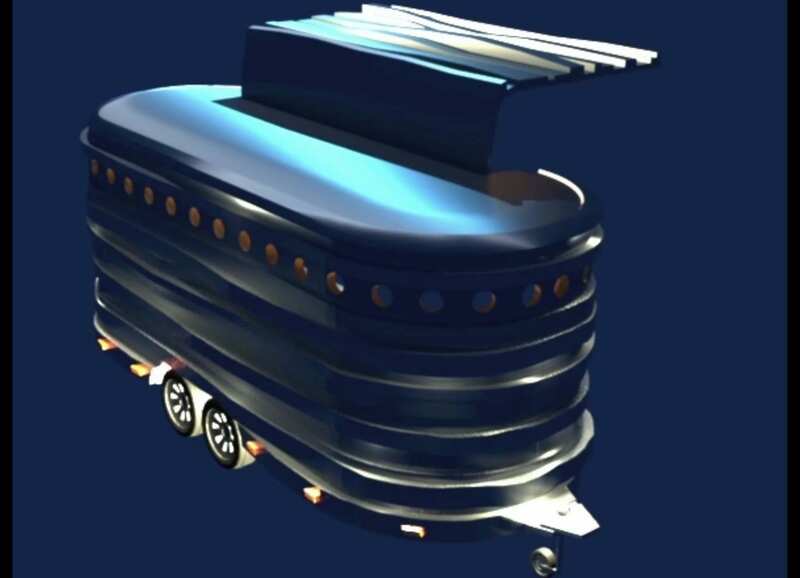 Besides, building a one-off trailer would be cost prohibitive. So we bought a flatbed trailer, brought it into the shop, did a close survey of it and basically re-built in our auto cad system. This gave Janet and I the opportunity to play with different design, engineering and functionality scenarios for the enclosure. It was a fun experiment in cosmetics! Safety and highway compliance are huge factors. That means a key next step was for me to do extensive research into the State of Washington State Patrol DOL (Dept of Licensing). I poured through Washington State’s regulations as well as title and registration requirements for trailers. With approvals in hand, we began cutting apart the frame structure of the brand new trailer. Once the trailer modifications were ready, we submitted it for inspection for safety and registration purposes. One of the key things I learned in researching the trailer industry is that it doesn’t allow for the easy purchase of off the shelf parts. So we custom fabricated many of the parts, which is something we like to do. The biggest challenge we faced was engineering the articulation of the trailer’s one and only door. After considering several options we determined it would be a 14’ long gullwing door, a feature that fans of the movie “Back To The Future” will recognize. That’s because the door looks like a DeLorean automobile door. The door is gas-spring driven, which is essentially the same mechanism as the hatchback of most mini-vans on the road today. It’s familiar to us because we use gas springs on vandal shields or access panels of signs. 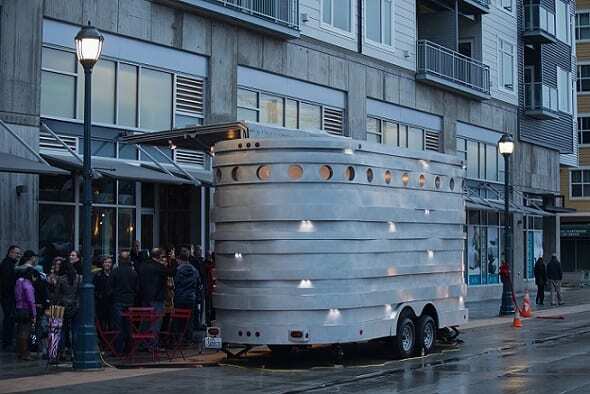 The artist intention of the design is that the trailer serves as a resonance chamber, broadcasting the sound out of the opening created by the gullwing door.